Here at Dex we have become aware of a gap in the market place. Your clients are now wanting good quality, well decorated items at a much reduced market rate. China Express provides you with China factory direct value, which is overseen by Australian quality, services and reliability. Normal indenting orders will take 10-12 weeks to New Zealand, with Dex China factory we cut the lead time down to 5-6 weeks by sea. We stock products, we print, we do QC in our factory in China. How does China Express work? All products are warehoused and decoration is undertaken in Dex Group China factory by staff who understand the products and decoration methods. 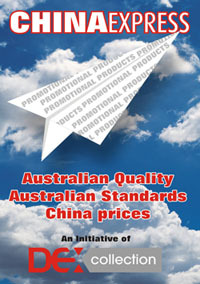 This ensures great value prices, Australian standards quality and reliability. In all cases, please discuss lead times and order processes with your account manager.